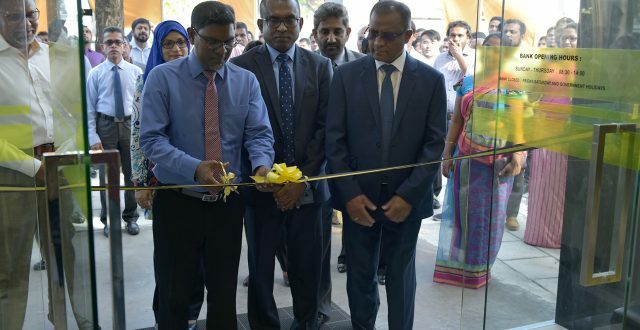 The first branch of Bank of Ceylon in Hulhumalé was opened today, in the commercial block of Amin Avenue teak tower, Hulhumalé. The ceremony was honored by its Chief Guest, Governor of Maldives Monetary Authority Mr. Ahmed Naseer. Bank of Ceylon’s Hulhumalé branch will commence their operations starting today and is expected to provide all services that are currently being provided in its Malé branch. Bank of Ceylon is currently one of the most used banks in Maldives, with both locals and expatriates seeking their service. With the increasing number of residents in Hulhumalé, opening of this branch will provide major convenience to the BoC users in the city. This branch, which is the second branch to be opened in Maldives, will also be a vital contribution to the commercial developments of Hulhumalé.